I am going to work on the assumption that this is going to be perfect to have with cheese. I haven’t actually tried it yet with the cheese but given that spiced jellies with a nice bit of camembert just sounds amazing, I’ll assume that it will be delicious. 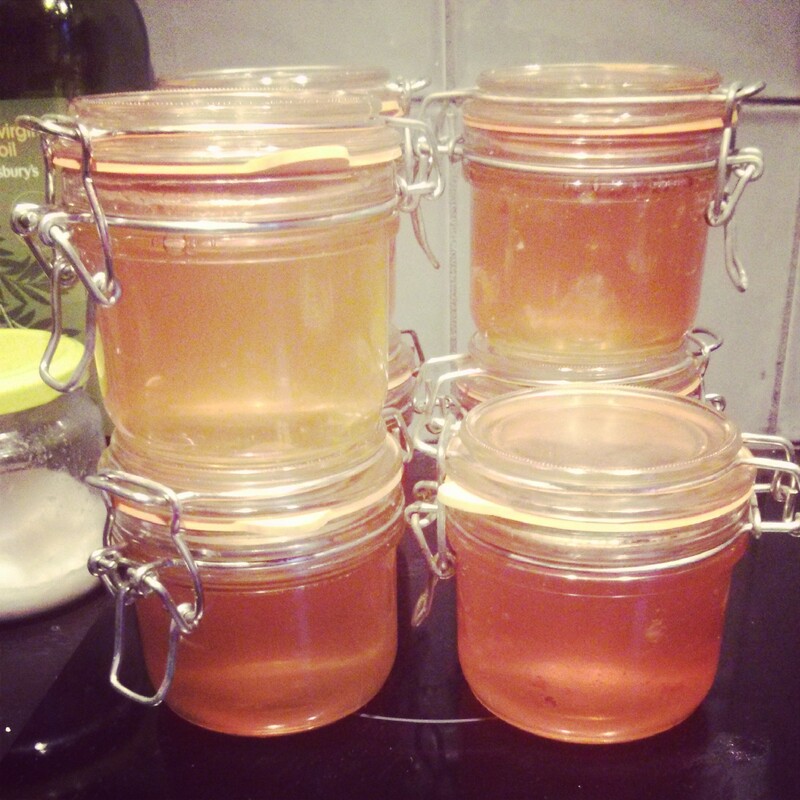 I decided to start off easy and make some quince jelly. I think it’s absolutely delicious and recall my lovely Aunt making me some a few years ago and thinking it was delicious. It’s also exceptionally simple to make and really, other than the overnight straining of the juice, quite quick. Chop your quinces roughly. Keep the skin and seeds in your rough cubes though. You need the seeds as they have pectin in them which sets the jelly. Place in a pot with enough water to cover them all. Simmer with the lid on until the quinces are soft – this took me about 1.5 hours. Strain the liquid through a muslin cloth/pillowcase overnight. In this case, this was a balanced contraption over a bowl. The next day, weigh out your liquid and add in equal amounts of sugar i.e. 500g of liquid, add 500g of sugar. I had 1104g of liquid, which I split into 2 saucepans equally and put 550g of sugar in each. In one saucepan, I added all the spices. Heat until they boil and then boil solidly for a minimum of 10 minutes. To check if they are done, spoon a teaspoonful onto a plate and leave to cool for a few minutes. If it wrinkles when you push a finger through it, then it’s ready to be jarred. Don’t forget to sterilise your jars(dampen jars and 30 seconds in microwave or 20 mins in oven!) before potting and make sure that you’re not adding hot jelly to cold jars or cold jelly to hot jars! 10 December 2013 in Cooking.